WASHINGTON – On the heels of a study of the U.S. “religious landscape” released last year that showed a quarter of Americans had changed faiths, a follow-up survey has found an even greater rate of “Faith in Flux,” as the latest report is called. When the number of people who now practice a different faith than that of their childhood is added to those who have moved around among religions or denominations and come back to where they started, nearly half of Americans have changed religions at some point, said the report by the Pew Forum on Religion & Public Life released April 27. Among people who have changed religions, those who left the Catholic Church were more likely than those who left Protestant denominations to have done so because they no longer believed the teachings of the church, the study found. It also made connections between how actively involved people were in their churches as children and teens and how likely they were to leave the faith in which they were raised. Across the board, the vast majority of people who changed churches, who stopped being affiliated with any faith or who transitioned from being “unaffiliated” with a religion to belonging to a church did so before the age of 24, the survey found. Greg Smith, research fellow for the Pew Forum, told Catholic News Service that among the more striking conclusions of “Faith in Flux” were the reasons people gave for leaving the Catholic Church, depending upon whether they joined evangelical or mainline Protestant denominations. Fifty-three percent of Catholics who became evangelicals said they left because of religious and moral beliefs, principally teachings on the Bible. 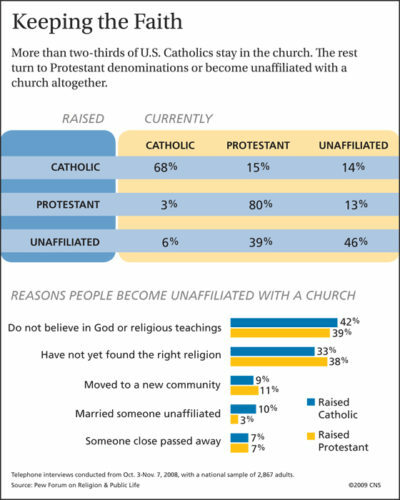 By comparison, 28 percent of Catholics who joined mainline Protestant denominations left because of differing beliefs. The main reasons for leaving cited by 40 percent of that group fell under the category of “religious institutions, practices and people,” including dissatisfaction with particular churches or clergy or objections to rules. The single largest factor cited by Catholics who joined mainline Protestant churches, however, was “family reasons,” such as marrying someone of another faith, mentioned by 31 percent. Nearly half the people who left the Catholic Church, 48 percent, did so before age 18, the survey found. One-third of Protestants who changed faiths left before 18, they said. Among both Catholics and Protestants, high percentages of those who have stayed in their churches were active in religious activities in their youth. But participation in religious education as a child, or in youth groups as teens, appears to have had little statistical difference in whether childhood Catholics are still Catholic. The study found that 71 percent of people who are still Catholic attended religious education as children, compared to 68 percent of Catholics who became Protestants and 68 percent of those who now belong to no organized religion. Thirty-two percent of current Catholics participated in Catholic youth groups, compared to 39 percent of Catholics who became Protestants and 32 percent of former Catholics who are unaffiliated. 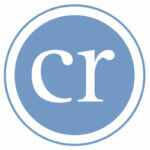 One-quarter of lifelong Catholics attended Catholic high schools, the survey said. Of Catholics who became Protestants, 16 percent went to Catholic high school, as did 20 percent of former Catholics who no longer are involved with a religious group. For this survey, Pew researchers re-interviewed more than 2,800 people from across the country who participated in the comprehensive “U.S. Religious Landscape Survey.” Results were categorized by whether people said they were “nonconverts,” either by remaining in the faith of their childhood or continuing to be unaffiliated with any religion, and by whether people had switched from Catholicism or a non-Catholic faith, had changed churches within Protestantism, or had joined or left a non-Catholic faith after being unaffiliated with any religion. Mr. Smith explained to CNS that the survey was unable to provide data on people who became Catholics because of the small number who were interviewed. Although those who switched to Catholicism make up 2.6 percent of the U.S. population, Mr. Smith said, that translated to just 69 interviews for this survey, too few from which to draw statistically meaningful conclusions.